Even those of us who aren’t so savvy about economics know that Greece is in big trouble – but the country’s very first eco-community, which is currently under construction, offers a green glimmer of hope. Situated on Mt. Telethrion, the Telaithrion community aims to provide a model for sustainability and healthy living that is harmonious with the earth and its residents that the whole nation can learn from. When complete, the project will include a host of sustainably built geodesic domes and yurts, as well as a forest garden, sheds, compost heaps, and much, much more. But they need help, for which they are turning to the Indie GoGo crowd. More deets and a video after the jump. Crowdsourcing is becoming an increasingly important source of help for architecture and design projects – particularly those with a humanitarian bent. And the Telaithrion Project is nothing if not that. At present they are only raising money for a 100 square foot central dome that will become the community’s foothold – a place to host seminars, awareness forums, and skills exchange festivals. The dome will be purchased from Pacific Dome International sans the materials needed to create a floor and the community hopes to complete this aspect of the project by spring next year. When the entire vision is realized, Teliathrion will consist of 3 basic sections – a geodesic dome cluster, a residential area comprised entirely of different sized yurts, and the forest garden. 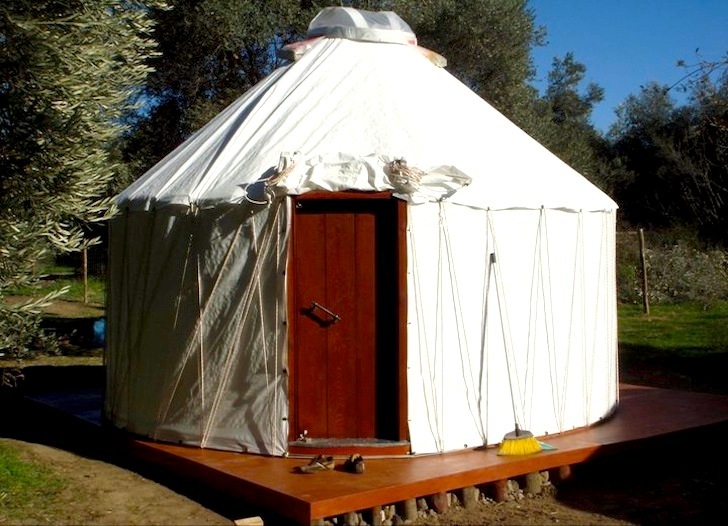 Both the domes and yurts feature a cluster layout with a large central building surrounded by several smaller buildings of the same basic structure. In so doing, the group managed to reduce their energy and material needs by a factor of 5. The entire facility will be powered with renewable energy and only green transportation will be used. It’s an amazing and necessary project that will help Greece make the shift to a more sustainable future. Even those of us who aren't so savvy about economics know that Greece is in big trouble - but the country’s very first eco-community, which is currently under construction, offers a green glimmer of hope. Situated on Mt. Telethrion, the Telaithrion community aims to provide a model for sustainability and healthy living that is harmonious with the earth and its residents that the whole nation can learn from. When complete, the project will include a host of sustainably built geodesic domes and yurts, as well as a forest garden, sheds, compost heaps, and much, much more. But they need help, for which they are turning to the Indie GoGo crowd. More deets and a video after the jump.